I hope you like this one, a wild rose, I think it came out extremely well. Often, what is believed to be a wild rose, fluffy pink roses around abandoned home sites, are not wild roses, but the descendants of cultivated roses tough enough to survive without human care. .Roses have been hybridized since Roman times, there are thousands of tough, long-lived hybrids. True wild roses, the botanical term “species rose,” occur naturally, with no human involvement. There are over 100 species of wild rose, some native to North America, many from the Orient and Europe. All have five petals and almost all of them are pink. A few species are few white or red, a very few may be yellowish. 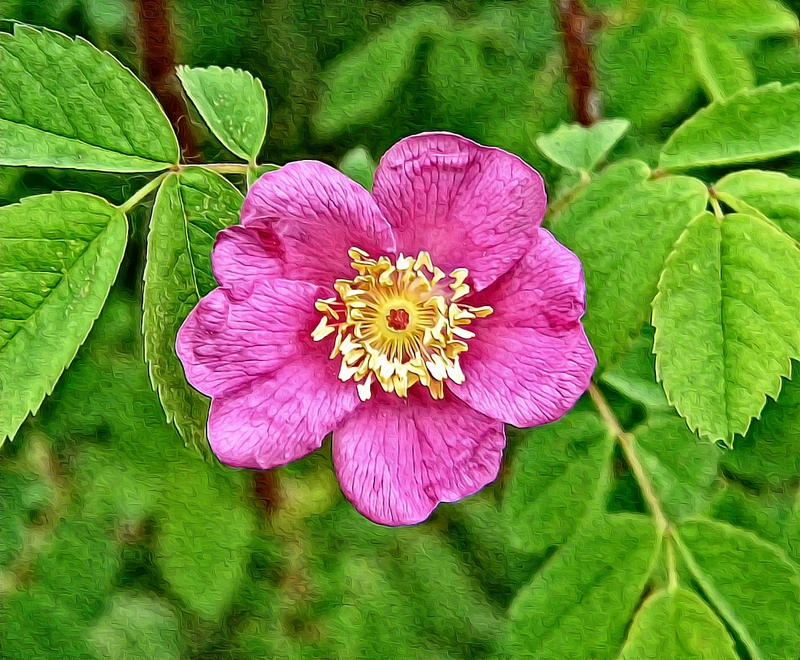 Two species, Wood’s Rose (Rosa woodsii) and Nootka Rose (R. nutkana) are common to the Northwest, Western Canada, and parts of Alaska. The image above, from a photograph I took, is of one of those two species. Determining which can be very difficult as they are very similar and each appears in a number of varieties. Wild roses serve as browse for browse for big game, including moose and deer, from spring through fall. Porcupines and beavers also browse the leaves. Wild rose hips persist on the plant through much of the winter. Many birds and mammals are sustained by these dry fruits when the ground is covered with snow. The dried leaves are used as a tea substitute. Used as a medicinal plant all over the world for thousands of years wild roses are mentioned many old manuscripts and even in the tombs of Egyptian pharaohs. Wild rose hips contain citric acid, flavonoids, fructose, malic acid, sucrose, tannins, vitamins A, B3, C, D, E, and P, calcium, phosphorus, iron, rutine, hesperidin and zinc. Research indicates that wild roses may aid in halting or reversing the growth of cancers. Rose hips are also known to lower saturated fats and triglycerides, helping to control blood pressure. The seed is rich in vitamin E and an oil extracted from the seed is used externally in the treatment of burns, scars and wrinkles. A poultice of the chewed leaves is used in an emergency to allay the pain of bee stings. Europeans utilized hips as a source of Vitamins A and C. Rose hip powder was used as a flavoring in soups and for making syrup. . The leaves were steeped for tea, petals were eaten raw, in salads, candied, or made into syrup. The inner bark was smoked like tobacco, and dried petals were stored for perfume. If you have ever eaten a rose hip you may have noticed that it may taste somewhat apple like. The interior of a rose hip, and the seeds, may also remind you of an apple. That is not an accident. The Rosaceae (The rose family) includes not only roses, but also the genus Prunus (plums, cherries, peaches, apricots and almonds), as well as raspberries and strawberries.